It's preferred to use a dedicated download manager for efficient downloads rather than using your browser download page. 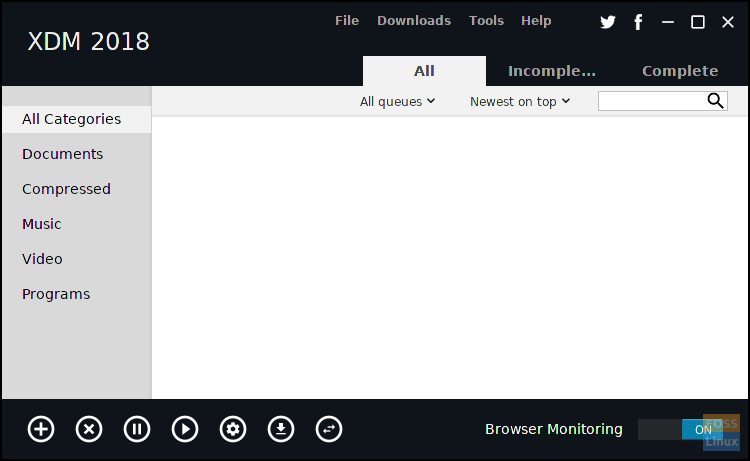 Xtreme Download Manager is a great open-source choice for Linux users. Downloading files from the internet is a part of the daily routine of the users. Work-related documents, assignments, projects, images, videos, etc. are part of the download routine. 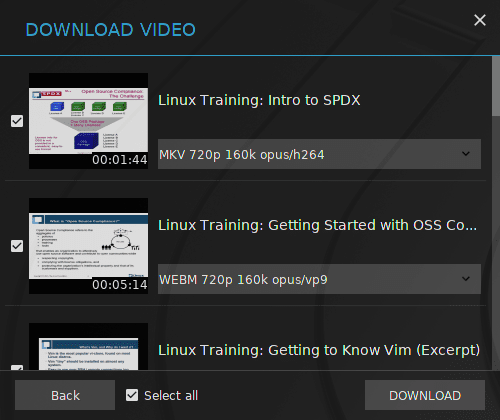 Especially for us Linux geeks, its often Linux distributions on the downloads page. For all these downloads, we always try to make sure they finish as fast as possible. This becomes a necessity if you’re on a slow network. Other than that, there is always the threat of a big file crashing through the download process, and having to start it again. So what to do about it? Try Xtreme Download Manager. Xtreme Download Manager lets you control your downloads efficiently with many additional features. As for speed, it claims to gain up to 5 times the usual speed, but just like no free energy can be generated, a download manager can’t tap a speed more than the internet speed allocated by your ISP. 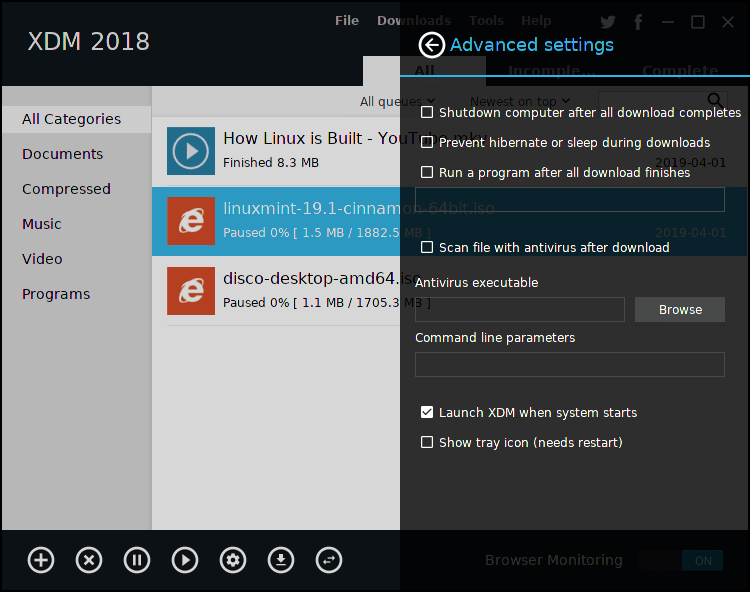 It’s just that XDM segments downloaded files dynamically during download process and reuses available connections without additional connect and login stages to achieve best acceleration performance. Let’s go through Xtreme Download Manager features. XDM comes with a clean and complete interface. Downloads are all categorized, and the files you download will go into the categories as they finish. Three tabs are available for viewing, one for ‘All‘ downloads, one for ‘Complete‘ ones and one for ‘Incomplete‘ ones. It helps you keep the downloads uncluttered. A simple on/off toggle button is provided to enable/disable browser monitoring. Other than that, ‘File‘ options, ‘Download‘ options, ‘Tools’, and ‘Help‘ options are provided in the top bar. 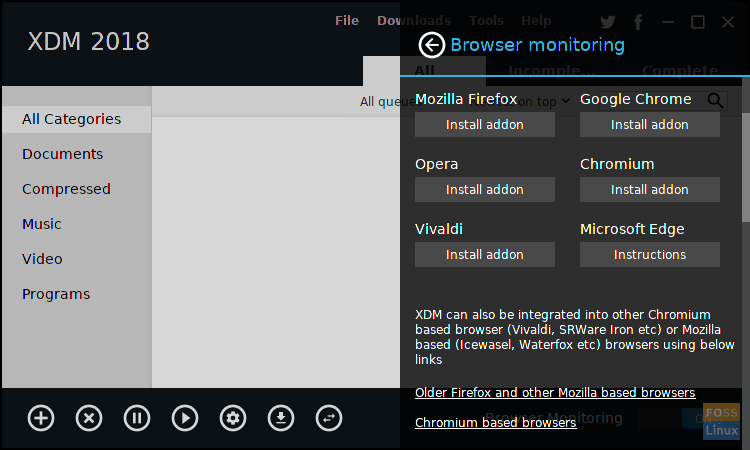 XDM supports a wide range of browsers. Major ones like Firefox, Chrome, Opera, Vivaldi, etc. are listed right at the front, and other than that, some Chromium bases browsers (eg. : SRWare Iron) and some Firefox based browsers (like Iceweasel) are supported too. Once you integrate XDM with your browser, it will automatically redirect all downloads to the manager, helping the users manage their downloads very conveniently. The following image gives a comprehensive list of the supported formats. 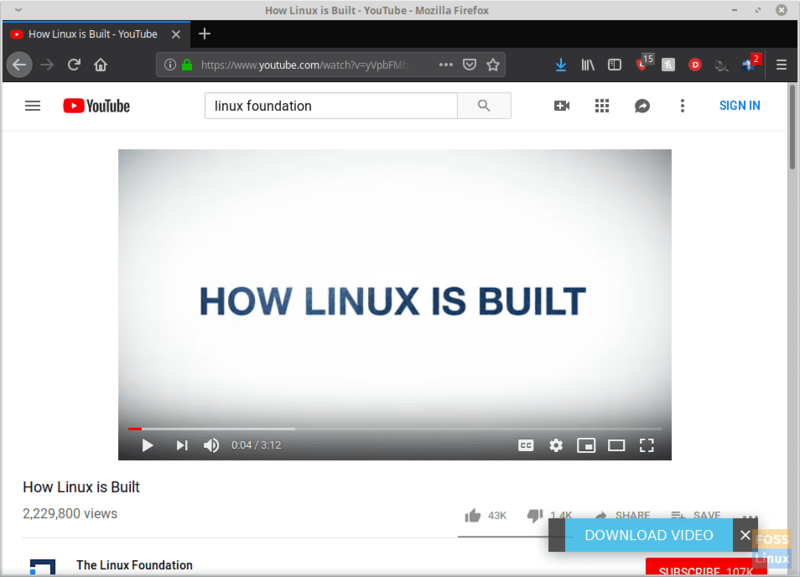 You can even download any videos that you stream on the integrated browser. For every video that you play, your browser will prompt you with an option to download it with XDM. It allows users to save any video to their systems, irrespective of the source website or content. If given the link, it can even download a whole playlist. By going into ‘File‘ -> ‘Download Video‘, and providing the playlist’s link, users can get the list of the videos on that playlist. Now with a simple check-uncheck interface, users can choose to download some of the videos or all of the videos of the playlist. 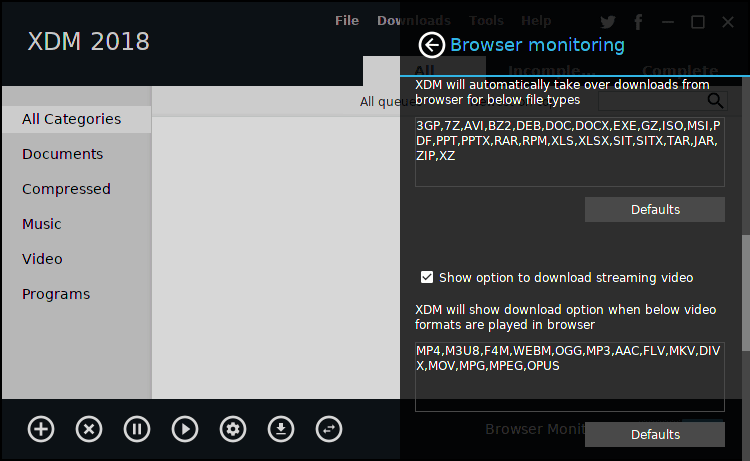 When downloading directly from the browser, XDM provides some basic download options for easy and quick configuration. 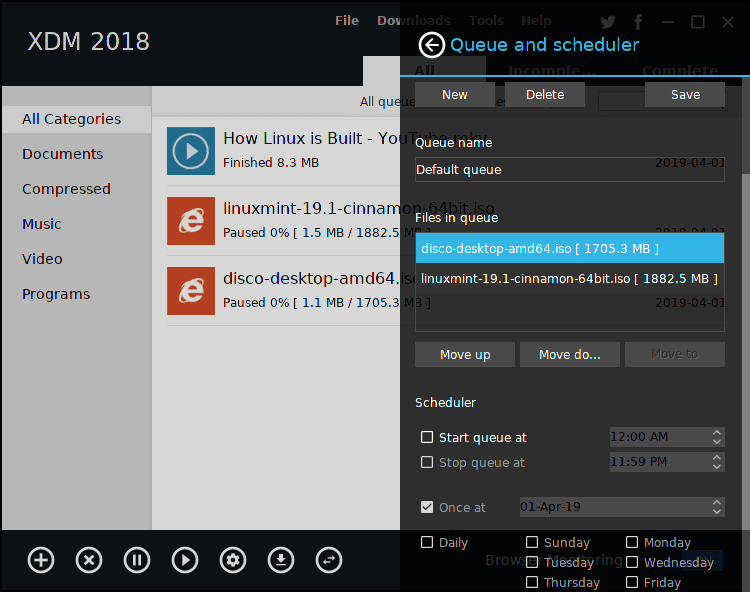 The options include the destination directory setting, conversion of the format (in case of videos), and a feature to enable delayed downloading of the file. XDM provides a built-in media converter. The converter is adequate and provides many options for conversion. Other than that, it provides ways to change some properties of the video, such as the frame rate, audio/video codec, resolution, aspect ratio, sampling rate, etc. The available conversion options are all that the majority of the users would require. Other than that, scheduler lets users configure according to their requirements. The items in the queue can be made to start at any given point of the day, on a specified date, or specified days. The ‘Settings‘ menu provides a set of advanced options to run after the queued downloads are finished. One important given option is to prevent the system from going into sleep/hibernate mode while the downloads are still running. Users can choose to shut down the system or run a specific program when downloads complete. Post-download antivirus scanning is also available. These were the significant features of XDM. Other than that, it has some added perks including speed limiter, a password manager, and support for proxies. Press the Tab key where given so, and the terminal will auto-complete the name. And just like that, the program has been installed. Xtreme Download Manager is a feature-packed program, excellent at doing what it is supposed to do. It fetches the best download speeds by utilizing the full internet speed allocated by your ISP. Advanced features like support for proxies and queue management provide significant flexibility, making it suitable for all user levels. Let us know what you think about XDM in the comments. Cheers!